It is a cliché to say that Americans never talk frankly about race. Yet our aversion to honest talk about race pales compared to the lazy, intellectually dishonest and cowardly way we discuss one of the major ethics conflicts of our age, abortion. 1. For some reason, it took seven months of the campaign for the Republican presidential nomination for anyone to ask Donald Trump about his views on abortion, which is a core issue to conservatives, progressives and feminists, as wellas a major factor in the controversy over the composition of the Supreme Court. Never mind that Trump’s answers were incoherent and contradictory, and that he took five different positions on abortion in three days last week: what was outrageous about Trump’s answer(s) was that he was obviously winging it. He had never given the issue any quality thought at all (if he is capable of quality thought, which I doubt), and faking it, indeed as he has faked his entire campaign. Do Trump supporters need further smoking gun evidence that he is not only unprepared for the Presidency, but too lazy, irresponsible and intellectually limited to be trusted with the job? Okay, we know they do, because they are impervious to logic or reason. Still, this was a stunning display of Trump’s hollowness and incompetence as a candidate. To begin with, the statement is false: the Supreme Court has ruled that embryos do have rights at some point, much disputed, before they are born. She was correct, however, that a living, growing organism that left alone and allowed to mature will be born, and will upon birth be a person in the eyes of the law and in the definitions of common sense, is by definition a person prior to that except for the absence of its birth, and thus is, by common construction, an unborn person, or, if you prefer, unborn human being, unborn baby, or unborn child. A bill is an unpassed law. A manuscript is an unpublished book. A law school grad is an unlicensed lawyer….which is to say, not a lawyer until something happens that has not happened yet. Hillary did not misspeak, except that speaking the truth is misspeaking to the pro-abortion lobby. Entertainment! Celebrities! Medical research! Charity! Public Education! How could there be anything unethical about such a phenomenon? Well, ethics often throw cold water on all manner of activities human beings crave, so it should not be too great a surprise that the “Ice Bucket Challenge” has generated quite a few ethics-based objections. Let’s examine the potential, alleged and actual ethical flaws of the current fad, and rate them on an Ethics Foul Scale from zero (No ethical concerns at all) to ten ( Very Unethical). Anything can be dangerous if you are not sufficiently careful, and the Ice Bucket Challenge had its consequentialist moment when four firefighters were injured, one very seriously, trying to help the marching band at Campbellsville University get dumped with ice water this week. Two firefighters were in the bucket of their truck’s ladder preparing to douse the students using a firehose when a surge of electricity jumped from nearby power lines and electrucuted them and two colleagues. This was just a freak accident, however. 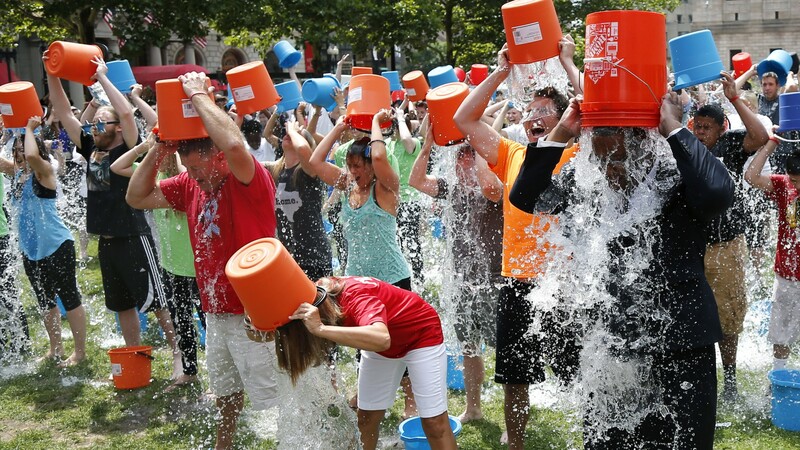 Unlike the so-called Facebook Fire Challenge, the ALS fundraisng stunt shouldn’t be perilous to anyone, as long as practitioners don’t get too grandiose or creative.